Memory Depth: Standard 2 Mpts/ch memory. Up to 24 Mpts (option). The Vehicle Bus Analyzer is the first conventional oscilloscope to decode CAN serial data into Symbolic (application layer) text. Now, for the first time, an engineer has both the full range of CAN protocol stack information-symbolic, hex, and electrical signal-and the ability to view additional in-circuit electrical signals (sensors and actuators, voltage levels, transients, etc.) that influence the CAN bus. In addition, up to four different CAN buses can be decoded at one time. 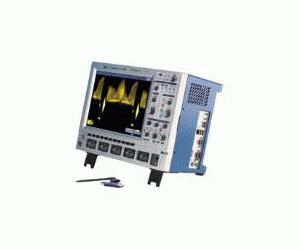 Standard and specialized oscilloscope tools can be used to validate and debug designs. Direct symbolic decoding and triggering allows fast and intuitive understanding of events. Simply load your existing DBC database file into the oscilloscope (no re-entry of data is required); capture CAN message traffic; and all electrical (signal), protocol (hex), and symbolic (application) layer information is quickly displayed on the oscilloscope screen. Use standard oscilloscope and specializedVehicle Bus Analyzer tools to find rare events, automatically measure and statistically analyze event timing, and graph/plot information, including extracted CAN message data. The VBA concentrates all your information in one place. Timing measurements across gateways are now possible. Understanding is fast, intuitive, and in a familiar format. Complete, time-correlated understanding of all ECU or circuit behaviors is simple. Time-consuming workarounds are a thing of the past. The VBA can make many measurements not possible with other instruments. Aside from timing measurements, the VBA can also extract CAN data from a CAN message stream, graphically plot that data on the oscilloscope display, and compare it to other electrical signals. Here, information on the steering angle and steering angle rate of change is extracted from the CAN message acquisition, rescaled to decimal values, and plotted as a time-correlated "Track" on the VBA display. All Vehicle Bus Analyzers are complete with a powerful LeCroy WaveRunner Series oscilloscope, Vehicle Bus Analyzer software, and CAN bus triggering hardware kit.